The ferries run all day. The free commuter ferries begin at 5:15am (leaving the Broadway Pier for Coronado); paid ferries start at 9am. 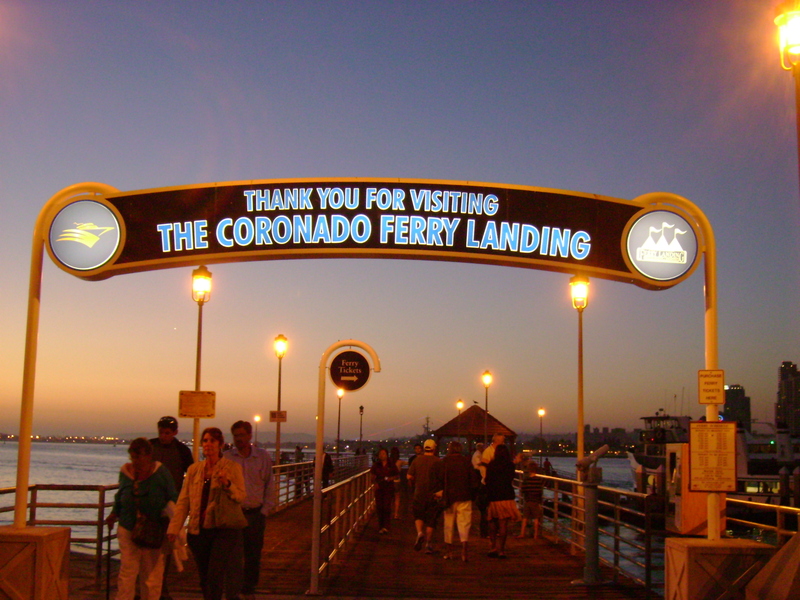 Last ferry leaves Coronado at 9:30pm, (10:30pm, Friday and Saturday). One of the little known activities at the Coronado end is fishing from the pier. Mackerel, bonito, sea bass, sting rays, sharks. The Landing includes plenty of tourist shops, but some of the town’s premier restaurants sit on the waterfront here and take advantage of the views — Peohe’s, Candelas, Il Fornaio. For visitors, the Landing is one of a few places where you can rent surries, four-wheeled carriages powered by peddles. Helps to have at least two peddlers. The Coronado Ferry is $4.25 per one-way adult ticket (much cheaper than a Harbor Excursion) and kids under 3 are free. Ferries leave the Broadway Pier and the Convention Center beginning at 9 a.m. and ending at 10 p.m. See the full schedule.